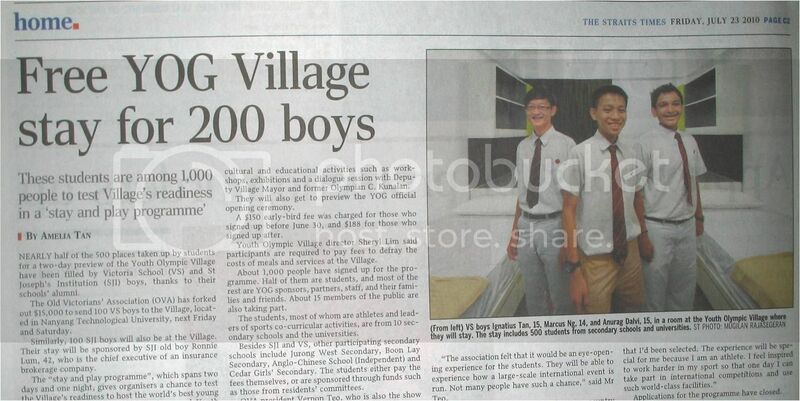 Students to pay for YOG Village “readiness test”? “The ‘stay and play programme’ , which spans two days and one night, gives organisers a chance to test the Village’s readiness to host the world’s best young athletes during the August 14-26 inaugural Youth Olympic Games in Singapore. Participants will tuck into the same buffet spread that will be served during the Games, spend a night in the rooms where the athletes will stay, and attend cultural and educational activities…. A $150 early-bird fee was charged for those who signed up before June 30, and $188 for those who signed up after. Youth Olympic Village director Sheryl Lim said participants are required to pay fees to defray the costs of meals and services at the Village. PS: 200 tickets are being sponsored by two individuals for 200 students. 1,000 students have signed up for the programme. 1. Do the real youth athletes, from all the countries, have to pay when they stay at the Village as well? 2. The organisers want to “test the Village’s readiness” but it is making students pay for this? 3. Is the fee for “per head” or “per room”? 4. Is the Straits Times report’s headlines misleading?